In the Swiss National Park (SNP) long-term research is one of the main objectives. Scientific data has been collected for almost 100 years, many of them in a geographical context within this alpine environment. The digital era started in 1992 when a geographical information system (GIS) was established. Over the years a considerable amount of analogue and digital data has been accumulated which the SNP is obliged to keep available for future research generations. As one of the few undisturbed reference areas for global change with such long-term data series, the preservation of the source data is of high importance as the value of data increases as the time series are and will be continuously updated. When preserving long-term scientific data in digital forms one inevitably faces a manifold of problems not found in traditional (non-digital) archiving. We identified a set of obstacles and pitfalls which can have catastrophic effects on both archive creation and maintenance in a small scaled organisation like the SNP. There are three main classes of threats to digital data and their archives: hardware, software, and brainware. The rapid developments in hardware and software are well known aspects making archiving of data and especially geodata a challenge by itself. One of the biggest threats to geodata is the so called brainware, i.e. users, data maintainers, system managers and on the long-term the heirs clearing the garret of their deceased ancestors, once brilliant researchers, unaware of their data collections’ value. The SNP has encountered multiple pitfalls in its effort to preserve geodata. The development of the GIS software with its regular updates and enhancements resulted in several losses of data due to format incompatibilities despite of sticking with the largest GIS software vendor throughout the years. In comparison, traditional media selection in non-digital archives seems to be idyllic, as paper is the most stable and endurable storage known for centuries. The mere volume of data handled at our Geo-data center amounts to several terabytes, posing considerable problems in terms of backup and archiving and especially archive maintenance. Metadata is an accepted key requirement without which data must be considered useless. Especially in long term data collections, metadata by itself does not sufficient. Current concepts for finding metadata focus on search engines with either unstructured or highly structured search strategies, unfortunately disregarding the fact that data must be embedded in knowledge retrieval systems spanning from traditional knowledge repositories (publications, libraries) with current digital content management systems and metainformation on data lineage. Such a meta-meta database system was developed for two research hotspots in nature reserves in Switzerland, currently containing roughly 3000 items. 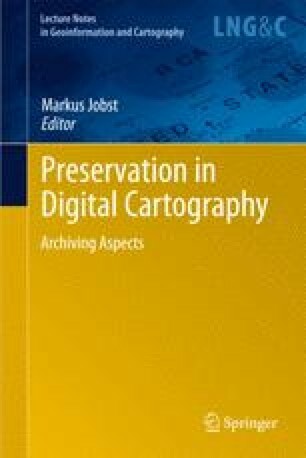 Further research is urgently needed for digital geodata archiving to improve technical and administrative aspects as well as to build a strong awareness in scientific disciplines that not only archiving publications but source data as well is a key component when trying to better understand our changing world. Bundesgesetz über den Schweizerischen Nationalpark im Kanton Graubünden 1980, Bern, viewed at 09 February 2009, <http://www.admin.ch/ch/d/sr/454/index.html>.